If we need to specify a certain distance to a point or an object without the need to go to that object, then the following formula may help. Tools needed are only measuring angles tool or protractor or compass, and measuring distances tool or measuring tape. Picture a triangle above is considered as a top view of a plan to measure the distance from A to objects or measure the distance from B to object. 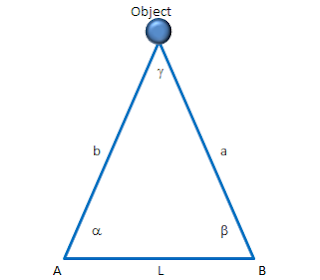 If the angle a is known, the distance between A to B or L is known, and the angle b is known, then the distance between A to object, and the distance between B to object can be calculated, without the need to go to the object directly. Results with the best accuracy obtained if a and b are about 35 to 55 degrees. By using a Theodolite or Total Station equipment as used by the surveyors in the field of geodesy, the measurement can be performed with accuracy up to seconds. This Excel sheet is containing the following formula to calculate the distance to an object. Unit of measurement of distance that is calculated can be anything, such as: meters, km, feet, miles, etc..